The sun was just peeking over the brewery when Davey Humphridge threw open the window above his bed to gulp down the cold morning air and bask in the early light of what he felt pretty sure had to be the first day of Decemberon. It wasn’t much of a view – it never was – but there was something magical today in the air slipping down his throat like iced water and the sunshine lining the brewery roof with gold. He’d been awake for hours already. He’d heard noises in the night. Which certainly wasn’t unusual. Jeopards often played catch with roof tiles or scared up seagulls, the occasional rider clip-clopped by in the streets, drunks stumbled homeward, shouting or singing or collapsing noisily into barrels and the like. But last night’s noises had all conspired to sound like only one thing: Decemberon climbing down his chimney, moving through his house! He’d been good. Desperately good. And he’d shut his eyes up tight, just like the beggar had told him. When he was tired, it was incredible how easily his eyelids fell closed. But last night – oh, it had taken such hard work to keep them shut. All his effort as he lay there and listened. His heart beat so loud in his chest, Decemberon could have stomped around in heavy boots and he might not have heard the King Of The Fieries’ footsteps. Now, Davey heard clinks and clunks of his mum laying out the breakfast things downstairs. And the rumble of his dad’s voice, making conversation or clearing his throat, it was impossible to tell through the floorboards. Davey jumped off the bed and raced out of his bedroom. He wanted to fly down the banister but settled for a reckless dash. He hopped down the last few stairs and barely landed in the hall before he was running into the living room. His eyes swelled and he was bursting with smiles. He knew it. He knew it. Of course he had. Davey’s dad owned the brewery. It was why they lived here, right close to work. And some days Davey would get home from school and look out his bedroom window and wave down to his Dad in the brewery yard. But more importantly, his Dad was rich. Loaded. And when Davey had told him all about Decemberon, well, he wasn’t about to be outdone by anyone else. No, sir. If he was going to do a thing, he wasn’t going to do it by halves. If they were going to have a visitor during the night, they were going to make him welcome and put out a proper spread. A buffet fit for a king, Dad had said with a hearty laugh. And Decemberon had been. And eaten the lot. And – Davey leaned over to peer into the goblet – yes! he’d drank that down too. Davey clapped. Haha. Decemberon wouldn’t have wanted much else from the other houses around. He glanced around the room eagerly. Dad sauntered in behind him. Davey spotted the large sooty patch on the rug, the dusting of ash all around the hearth. But he couldn’t see any gifts. Not anywhere. Dad sniffed. “Lord! What the hell’s that smell?” Dad toured one side of the room, sniffing some more. His nose, bulbous and red but famously sensitive, led him over towards the potted plant in the corner. He pulled the pot aside and bent to look behind it. Suddenly he backed up and clamped a sleeve over his mouth and nose. His face wrinkled and turned a pale green. He flapped his arm in front of him and tried not to look too hard at what he’d found. “And that, boys and girls, is why every year at this time we celebrate the Festival Of Decemberon. A lot of parents were confronted with a lot of glum-faced kids, disappointed at not getting any presents, and rather than having to deal with that through a cold winter month they tried to cheer the brats up by buying something nice from the market. “In subsequent years, I didn’t even have to tell my stories. The merchants were fully on board – specially the bakeries, since mince pies sold like hot cakes that time of year. And sherry. Yeah, the people who make booze did all right out of it too. They promoted Decemberon as an actual thing and some creative types had the bright idea of selling decorations to spruce up the house. They even sold special trees for the occasion, for folks to stick in the corner for Decemberon to, ah, leave his presents behind. The scent of pine, they said, would counteract the smell. “Course, I don’t do the full rounds of every household every year. It’s just not feasible. And sometimes I pop down the chimney to find the pies already scoffed, the sherry glass already drained. Parents, probably, stuffing their faces to help maintain the illusion. That or those blasted jeopards got wind of the free grub and drinks on offer. “Kiala knows. She’s a pain in my proverbials, but she’s a smart girl – curse her hide – and she twigged to my part in it all that first year when a few people asked her to investigate a spate of mysterious home intrusions. Still, I pointed out to her she couldn’t exactly tell anyone, since they’d be liable to be upset if they knew it was her pet demon that went around breaking into people’s houses and helping himself to refreshments left out in good faith. “So all in all it’s worked out pretty well. “The one thing I didn’t count on was everyone being so flamin happy. They go around waving cheerily to each other and wishing everyone a Merry Decemberon. They send glittery greeting cards to neighbours and relatives in other towns they haven’t spoken to all year. It’s ridiculous. “And I’d just like to go on record to state categorically that happiness was not part of the plan. “Decemberon is a work of fiction. It was all about greed and any spirit of celebration or any semblance of joy arising from it is purely coincidental. “So, with that in mind, Merry Decemberon. You’re welcome. That’s it for our Tortentales for this year. Hope you enjoyed reading. And hopefully there’ll be more fun fantasy adventure to come in the New Year. There were existing alternative routes out of the undercastle, but Vermin found it more expedient to fashion his own. He’d put almost as much work into it as he had invested in his storytelling. Prying loose a bunch of stones from the back wall in a room where Kiala wasn’t ever likely to venture; eating said stones – good for digestion; excavating a short tunnel to connect with the city’s sewers. After a crawl along his makeshift tunnel, he emerged into this veritable home from home and paused for a bathe before climbing a ladder, popping a manhole and peering out to make sure the area was clear of passers-by. All quiet and deserted. He hauled himself out and replaced the manhole cover. He licked some of the excess sewage that clung to him to guard against dripping too much telltale mess around the cover. Then he clambered up the nearest drainpipe to access the rooftops. From the undercastle, he felt like he’d arrived in a new city-above-the-city. A broken landscape of tiles and thatch. A sprawling, undulant terrain with angular peaks and snaking valleys, all framed by the city battlements. Turrets and towers rose here and there like crags and tors chiselled into some semblance of order and neatness. The place stank of fresh sea air and Vermin was glad of the extra coating of waste he’d picked up. It was a good night to be out. A slender rind of moon, patchy cloud blotting out most of the stars. A biting chill to the air. A good Decemberon night. Vermin scrambled and sprang across the rooftops, seeking the smokeless chimneys. He’d taken care to be vague about which particular night in this month – named after the King Of The Fieries himself – Decemberon would descend. On the spur of the moment, he’d even given the last group of kids some spiel about the Twelve Nights Of Decemberon, adding that, although very magical, the King couldn’t possibly visit all the children’s houses in one night. Inspired stuff – and he wished he’d used it before. Anyway, it seemed the tale had spread to many homes in this neighbourhood and the people weren’t taking any chances. Nobody wanted to miss Decemberon, so there were plenty of unlit fires tonight. Vermin thought of the families, tucked up in bed and shivering under their blankets. The kids trembling from excitement as well as the cold. Bless. He trusted the wakeful ones would heed his warnings to keep their eyes shut tight. What with Decemberon being the brightest of all Fieries, hailing from the heart of a star, it was important that they understood the grave risk that they would go blind if they caught even the slightest glimpse of him. He landed on a thatch roof, disturbing a sleeping seagull. He snatched the bird from the air before it could squawk and flap too noisily, gulped it down as an impromptu appetiser. 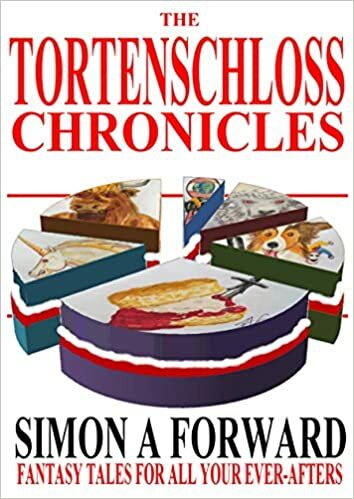 Some of the snootier echelons of Tortenschloss society might have raised an eyebrow or a nostril at the idea of poultry as a starter, but Vermin tended to circumvent etiquette by eating around the clock so the question of starters and finishing courses wasn’t generally a factor. A small troupe of jeopards – spotty baboonish pests with mischievous features and pink bottoms – watched with interest from a brewery roof just across a narrow lane. They looked a bit dopey-eyed, as though mildly intoxicated by the fumes that rose throughout the day from their chosen nesting place. Natural-born troublemakers, they would nevertheless keep their distance from him. Vermin bent over the chimney and squeezed his head into the opening. Making a bit like the Sludge that Kiala liked to call him, he squashed up his shoulders and the rest of his body, folding his wings up good and tight against his back and piped himself in like, he imagined, rotten toothpaste forced back into the tube. The first stretch was hard work, with some danger of straining a muscle or several, but it wasn’t long before he could expand and ooze gently down the shaft to land in a bed of raked, cold ashes. Soft and welcoming as a cat’s litter tray. Like soothing talcum powder on his hindquarters after the prickly thatch. He crawled out onto the rug, unfurled his wings and gave them a flap. Which fanned some of the ash over the carpet, but a few signs of disturbance would only serve to confirm that someone had visited. Which could only be good for the spread of his story. Besides, he hoped to leave further evidence of Decemberon having paid a call – by gobbling up any treats that had been laid out for him. And he was pleased to see quite a generous spread set out on the coffee table. Six pies arranged on a tray – with a lacey doyley, no less. Unnecessarily decorative, but he could forgive them for that. The pastry was lightly dusted with sugar and stained a sticky brown where the juices had dribbled out of the pie in the baking. Vermin leaned low over them, sniffing. Then licked his lips. Standing next to the tray, on a cork coaster, was a goblet of sherry. He sniffed that too. He wasn’t going to pause and do that every time. He was on a clock here: probably a fair number of households to get through and be back before Kiala woke. But it was worth savouring this, his first Decemberon feast. A deft flick of his tongue swept each pie into his mouth and he snarfed them down, one after the other. Washed them down with greedy slurps of sherry. Resisted swallowing the goblet and even deposited it back in its place on the coaster. The family here had outdone themselves. A lot of the kids had looked like dirty paupers so he could probably expect humbler offerings at other homes. Obviously, he’d lied about the presents. But he supposed he ought to leave them something. He spied a large potted plant in a corner of the room. It struck him as the ideal spot to secrete a gift. Kiala shook her head and emitted a despairing sigh, as she set about unpacking her purchases and stocking up the kitchen cupboards. Vermin enjoyed it when she despaired of him. The way he saw it, this jumped-up Sorceress – not even a full-fledged practitioner of magic, in fact, but a pupil, green as twenty-three-day-old bread with none of the age or wisdom – had summoned him, Vermintazaroth, Sewer Demon Of The Seventh Netherplane, against his will and now he was stuck with her. In a rare quirk of getting a spell right, she’d spirited him away from very important duties to aid in some battle, then confessed to having no idea how to send him back. Since he was stuck with her, he made it a mission in life to make her fully appreciate the extent to which she was saddled with him. She frequently rewarded him with complaints about how annoying he was and compliments on his appearance. Like calling him Sludge, because in her eyes that was what he most resembled. Which he knew were meant as insults and were rich coming from a girl whose pretty Sinoan features made him want to retch. Only his reluctance to let go of any meal enabled him to resist the urges. On the plus side, it meant his story was getting the circulation it deserved. They shared a home here in the Sunken Spire, a prominent architectural feature in the Tortenschloss Botanical Gardens. Kiala mostly confined herself to the cosy rooms in the tower, but there was a whole castle buried under the Gardens and, give her credit, she’d found him a lovely dank chamber in the depths to call his own. Which proved she really did care about him, deep down. Her old Master – no longer resident, long story – had laboratories and libraries and all sorts down there, which Kiala had barred him from exploring, under threat of banishment to the loft. Which was dusty, but much too airy for his tastes. “Yeah,” said Vermin. Never happen. For one thing, she’d often go out for a loaf of bread just to put off the latest daunting step in her sorcery self-teaching programme. Pro-crustination, Vermin liked to call it. He skulked off, headed for the stairs. He enjoyed the spiralling descent into dank and darkness. “Stay out of those labs!” Kiala called after him. He didn’t hurhur because there was too much danger of it echoing up the stairwell. He had every intention of staying out of the Master’s rooms. And more besides. He hadn’t lied about lying awake. He did a lot of lying whenever he was awake. But he mostly had other plans for tonight. “Hands up who’s heard of Decemberon?” the old beggar asked his eager audience. One child stuck his hand up. There was always one. The beggar laughed one of his special guttural laughs, all mucus and shingle. Of course, he’d rattled off this tale before, although not in this part of town. Stories – good ones, well-told ones – had a habit of spreading like a contagious disease, so there was a chance the lad had picked it up somewhere. But a storyteller ought to be able to spot a liar. And the beggar, a yarn-spinner of no ordinary talent, watched his audience closely, peering slyly out from under his heavy-shadow hood. He’d seen the way the boy had searched the faces of those around him, reading their ignorant, expectant expressions and seizing his moment to look superior. A natural-born fibber, that boy, but quick-witted. He could go far. But this was the beggar’s show and he wouldn’t stand for people nudging in for a bite of his limelight. “Not many of you, I see. Not many at all.” He tailed it off with another phlegm and pebbles laugh: “Hurhur.” And left it go at that. Hopefully the kid would be satisfied with his scored points and shut up and listen avidly like the rest of them. “Don’tcha mean Fairies?” piped a grubby-faced girl in the front row. “He means Fairies,” she informed the crowd. A lot of young dirty heads nodded their agreement. That had their attentions at least. Most had gasped and sort of stuck there, in a tableau of horror. Nearly thirty urchins, nippers and young scallywags sitting around on boxes and barrels or on muddy cobbles in this neglected backstreet behind the marketplace. One – another female – had the courage – or was sufficiently shocked – to voice their concern. The beggar was certain he could come up with a few choice words to say about her mother that would silence the girl, but ideally he preferred it if only good reports of the friendly storytelling beggar got back to the ears of parents. Comfort was not really a feature of the available furniture in this back lane and some of the kids fidgeted like lizards on hot sands, but they’d all obediently clammed up and sat waiting with open ears and eyes. Some of the kids let out appreciative oohs and ahs, which the beggar didn’t count as interruptions. They were a welcome sign he was winning them over. “I have! I have!” said the smart little point-scorer, thrusting his arm up again. “We don’t light fires in the summer.” Point-scorer again, being too smart for his own good. Point-scorer’s mouth wrinkled sceptically, but he wasn’t brave enough to argue the point. For now. This provoked more oohs and ahs. “What kind of present?” asked an excited girl. And every young face lit up in anticipation of the answer.